According to Ainu mythic poetry, the world was created when oil floating in the ocean rose like a flame and became the sky. What was left turned into land. Vapor gathered over the land and a god was created. From the vapor of the sky, another god was created who descended on five-colored clouds. Out of those clouds, the two gods created the sea, soil, minerals, plants, and animals. The two gods married and produced many gods including two shining gods—the Sun god and the Moon god, who rose to Heaven in order to illuminate the fog-covered dark places of the world. Ainu historical heroes include Kosamainu and Samkusainu. Kosamainu, who lived in eastern Hokkaido, led an Ainu rebellion against the mainland Japanese ruling the southern tip of Hokkaido, called Matsumae. He destroyed ten out of the twelve Japanese bases but was killed in 1457. Samkusainu organized Ainu in the southern half of the island during a 1669 uprising, but after two months they were destroyed by Matsumae forces armed with guns. The above myth represents just one of the many folkmyths transmitted by their epic poetic oral traditions. 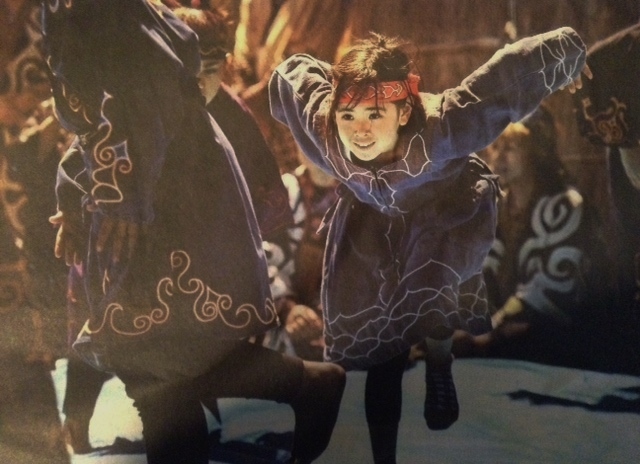 The Ainu have handed down a vast body of oral traditions. The main categories are yukar and oina (longer and shorter epic poems in literary Ainu), uwepekere and upasikma (old tales and autobiographical stories, both in prose), lullabies, and dance songs. Yukar usually refers to heroic poetry, chanted mainly by men, dealing with demigods and humans. It also includes oina, or kamui yukar, shorter epics chanted principally by women about the gods. The Saru region of south central Hokkaido is particularly known as the homeland of many bards and storytellers. Yukar was narrated by the fireside for a mixed gathering of men, women, and children. Men sometimes reclined and beat time on their bellies. Depending upon the piece, yukar lasted all night or even for a few nights. There were also festival songs, group dance-songs, and stamping dances. This myth showing the tradition of divine descent on a cloud shows the Ainu’s connection to the Far Eastern or Northeast Asian tradition where cloud symbolism and descent from the sky or heavens is a strong and widespread genealogical and mythical traditional motif associated with the ancient Mongols, Udegeys, Manchurians, and the Jurchen Tartars, Han Northern Chinese (spiral motifs better known as thunder patterns) and possibly proto-Mongol-Tartars before them. It may have been a far older motif of Northeast Asia from prehistoric times, as the cloud spirals are a common motif in ceramics of the prehistoric Jomon people of Japan, although interpretations lend themselves variously to both solar as well as cloud symbols. This cloud symbolism is given detailed treatment in Camman Schuyler’s article “The Symbolism of the Cloud Collar“, The Art Bulletin, Vol. 33, No. 1 (Mar., 1951), pp. 1-9 URL: http://www.jstor.org/stable/3047324 .